Koolance presented the CPU-360 as the company's new waterblock flagship. It's sold for $84.99 and is compatible with Intel's LGA775/1156/1366 and AMD's Socket AM2/AM2+/AM3. 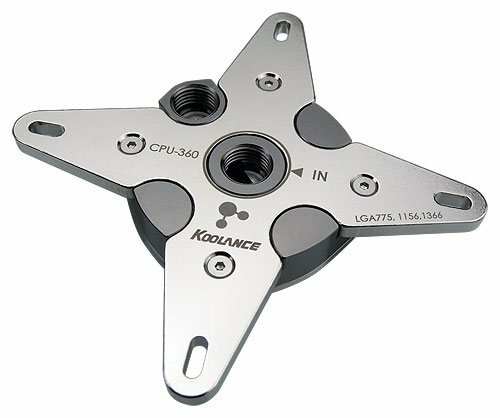 Following the extremely successful CPU-350 comes Koolance's latest high-performance CPU water block. The CPU-360 uses an advanced microfin cold plate (0.25mm fins, 0.30mm channels), o-ring sealed impingement plate, and an optimized flow path to yield best performance with relatively low coolant restriction. The CPU-360 contains a copper cold plate with brass top. As with all Koolance products, nickel plating is added to improve corrosion resistance. Two universal steel mounting brackets are included for mainstream Intel and AMD processors. The CPU-360 has standard G 1/4 BSP threading for any Koolance nozzle diameter. Please select the desired nozzle type for this base model (it does not include nozzles).